By Melissa Lennig on October 12, 2014 7 Comments. This content contains affiliate links. As an Amazon Associate I earn from qualifying purchases. Halloween is just around the corner! My boys are excited, as they love the costumes, candy, and spooky decorations. 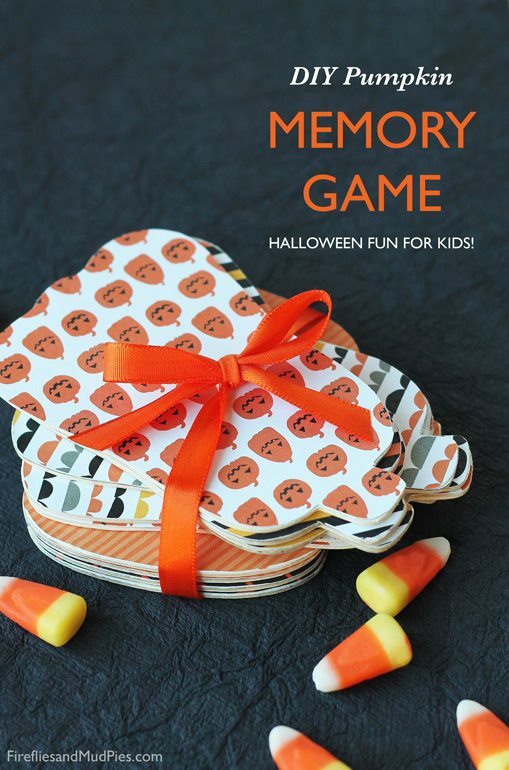 My youngest son recently asked, “Do babies like Halloween?” He was thinking about his cousin who is just a little over 1 and added, “She can’t eat candy and she might get scared.” We decided to send her a book and a homemade Halloween Memory Game to wish her a very Happy Halloween! If you’ve been reading Fireflies and Mud Pies for a while, you are well aware of my passion for super easy, low-cost crafts for kids. This memory game is no exception. I purchased all of the supplies on clearance and kept assembly very low-key. Read on for the tutorial below! 1. 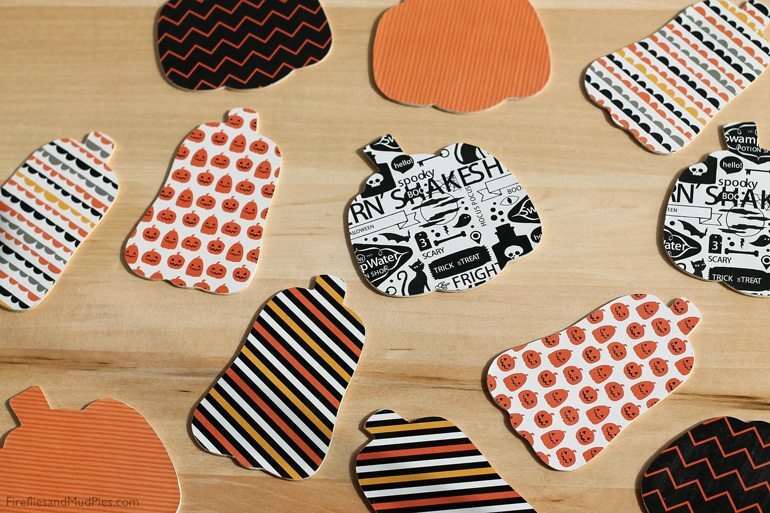 Trace the pumpkin shapes onto the white side of the scrapbook paper, as pictured below. 2. Cut out the shapes with scissors or an X-ACTO knife. 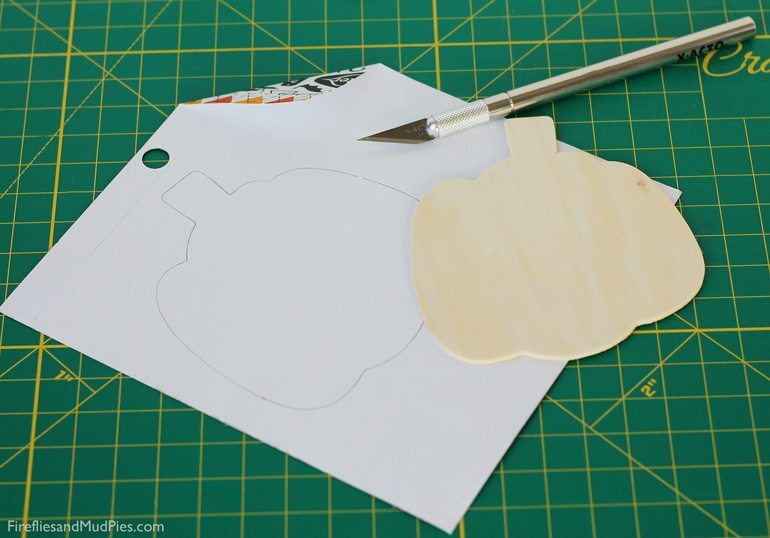 Attach the scrapbook paper to the wooden shapes using double-sided tape. If desired, seal the game pieces Mod Podge. 3. Flip the cards wood-side up, and play! The person who collects the most pairs, wins. Babies will enjoy exploring the vibrant colors and patterns on each of the cards. Challenge preschoolers to create repeating patterns with the shapes. There are so many fun ways to play and learn! 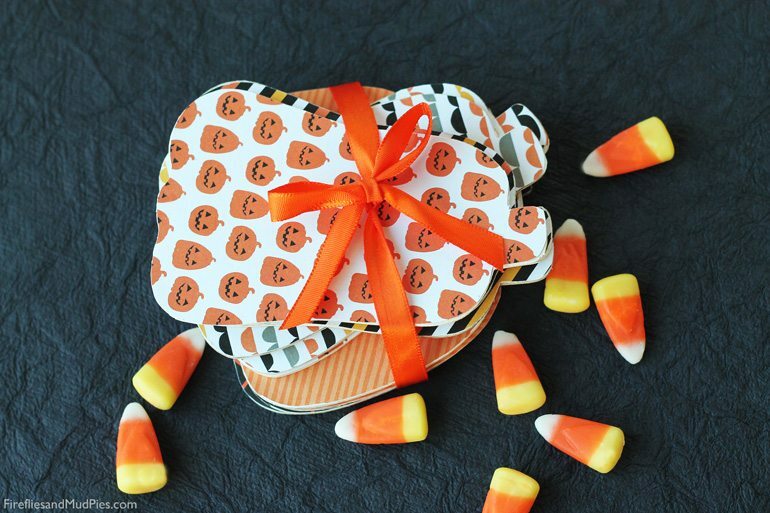 Just in case you haven’t enjoyed your fill of fall activities yet, listed below are 5 more sweet pumpkin crafts for kids! Follow Fireflies and Mud Pies’s board BOO! Happy Halloween! on Pinterest. Well, I had to come over to see how this is done. Great directions by the way–I think I could actually make this quite easily. I love the scrapbook paper you used. Something tells me I am in trouble if I go to the store to look for some (I don’t do scrapbooking) because I can see myself stocking up for neat projects like this. Thanks so much for sharing it. Pinned and shared. Turned out super cute, and you can use them to decorate with too!